Oh the Joys of Basil. 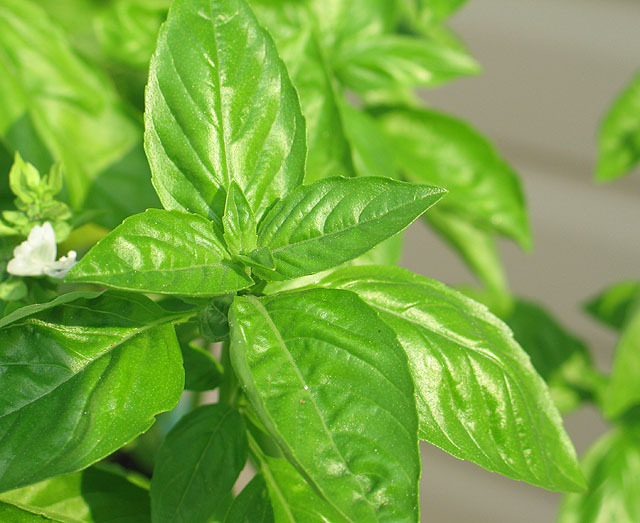 Basil is a leafy herb and is a member of the Mint Family. Did you know that? It is said to have a licorice/clove flavor. I hadn’t thought of that. I don’t really like licorice so don’t let that turn you off. The mixture of flavors is wonderful. In Taiwan they use basil leaves to thicken soups. Tea of 100% Basil leaves is said to help level out your blood sugar, and calm stomach ailments. Here is a neat website with 10 ways to use Basil. I’m not sure I’m up for a pure Basil tea but I discovered a cool way to add that touch of basil flavor to your regular iced tea. Boil water and pour it over the leaves. Let steep 10 minutes (the longer the better till water cools if you can wait that long). Remove leaves. You can do a second steep of the basil leaves to extract all the good flavor and use this with water to make the iced tea. It sounds weird right? But it tastes wonderful. Especially at dinner with Italian type foods. This entry was posted in Uncategorized and tagged Basil Iced Tea, Eden Glenn. Bookmark the permalink. Wow, what a great post. I loved it! I love tea and have basil growing in my garden right now. Don’t mind if I take advantage of your post and make some basil syrup. Pray that I don’t burn my kitchen down though, as I’m not a very good cook.